A well-known Russian defense manufacturer is launching a new arms business, and there is a strong possibility that the face of the manufacturer will be the famous and charismatic American film actor Steven Seagal. The Russian deputy prime minister in charge of the defense industry, Dmitry Rogozin, has made some very interesting statements, following a series of meetings held at the Degtyaryov weapons factory in Kovrov, Vladimir Region. The impact of these statements was reinforced by the fact that the head of the country’s defense industry was accompanied not only by members of the Military-Industrial Commission but also by Hollywood star Steven Seagal. 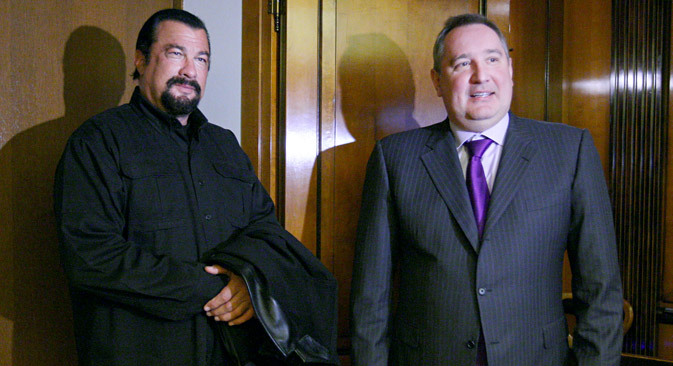 Steven Seagal — who turns out to be an old friend of Dmitry Rogozin — met with a group of veteran, arms industry workers. The American actor had accepted an invitation from the Russian deputy prime minister and was very interested to see what the Degtyaryov factory is presently producing. Now, the Hollywood star may possibly agree to become the public face of the Russian small arms manufacturer from Kovrov. The Degtyaryov factory, it would seem, is creating a robotics center as part of the new business. According to Rogozin, this will be one of the main places (if not the only) for developing specialized robotics. According to Vladimir Pavlov, head of the product life-cycle information support department at the Russian State Scientific Center for Robotics and Technical Cybernetics, Rogozin’s proposal is correct. “It’s very good if a base factory has been identified, where some kind of robotic systems can be produced; and the Degtyaryov factory is known as a good factory with top line technology. So this is something we can only be positive about,” Pavlov told Vzglyad. The expert was less complimentary about the overall situation regarding the development of robotics in the country. “We’ve lost all the ground that we held in the 1970s. At that time, there was practically no military robotics; robots were mainly used for industry and for some kinds of scientific research. They began to be used for military purposes only later, when some positive results had been obtained in robot-making. Then, in the 1990s, there was a general collapse — in industry, and especially in science — and almost all research in these fields was halted,” he said. Now, Pavlov believesthat the only good news stories come from the Ministry of Emergency Situations and some law enforcement agencies. “These are not quite military robots, of course, but equipment for emergency situations. But the Ministry of Emergency Situations is making good progress with robotics,” Pavlov said, adding that the situation in Russia with industrial robots, which are now being developed all over the world, is still bad. The day prior toRogozin’s statement, Russia’s Minister of Defense Sergei Shoigu also stated that Russian robotics was lagging behind foreign-made systems. According to Shoigu, the unmanned aerial vehicles, land-based robotic systems and unmanned submarines that are being developed for the Russian Ministry of Defense are inferior to their foreign counterparts in terms of their performance characteristics. Shoigu also recalled that the development of military robotic systems is being undertaken in accordance with the state arms program for 2011–2020, and this is a very important area. However, after the meeting, the deputy minister of defense, Col. Gen. Oleg Ostapenko, stated that the Russian Ministry of Defense was expecting specific results in military robot production in the next year or two. “A crucial meeting was held today, in which radical decisions were taken for the future development of a robotics system,” said Ostapenko. In general, the creation of robots in Russia has been the subject of active discussion for several months now. Based on materials from RIA Novosti and Vzglyad.